A wooden sculpture of a crucified frog, entitled “Zuerst die Fuesse” (Feet First) and made by late German artist Martin Kippenberger in 1990, is shown in an undated photo released in Bolzano August 28, 2008. A modern art sculpture, portraying a crucified green frog holding a beer mug and an egg that Pope Benedict has condemned as blasphemous, may have its days numbered. 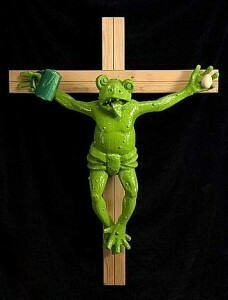 The board of the Museion museum in the northern Italian city of Bolzano were meeting on Thursday to choose whether to side with the pope and other opponents of the frog or with those who say it should be defended as a work of art. REUTERS/Courtesy Museion Museum/Handout (ITALY).